Indonesia, often associated as a popular holiday destination with beautiful destinations and polite citizens have a darker history behind all the partying and paradise spotlight. During the late 90s, a major event shifted the social, cultural and political tides in Indonesia with the downfall of President Suharto in 1998 (SMH 2008). After 31 years of strict, conservative but more importantly, repressive regime was finally overturn, which resulted in a switch into a democratic regime that was followed up with social progression and freedom of speech (ABC 2014). This very well may not have happened without the loud protest of the punks in Indonesia. With one of the biggest punk rock scenes in the world, the punk movement can be perceived as a gateway to countercultural ideas and radical political views that question traditional thinking (VICE 2014). The punks believe that they “have power and autonomy” (ABC 2014 para. 11) to challenge the “oppressive, corrupt, violent and authoritarian regime” (ABC 2014 para. 11) that is their country’s government (ABC 2014). Through music as their medium of expressing, they educate the young Indonesian youths living on the streets about freedom, independence and a community that breaks away from the Sharia, the Muslim moral code (Noisey Vice, 2014). The punks offer much more than just ideals and radical political perspective, they also educate the youths on the street through music evident in the punk rock band Majinal whom through workshops teaches the youths also known as the “Anak Merdeka”,the free children, to sing and play the ukulele both as a way of expression and to make a living (ABC 2014). 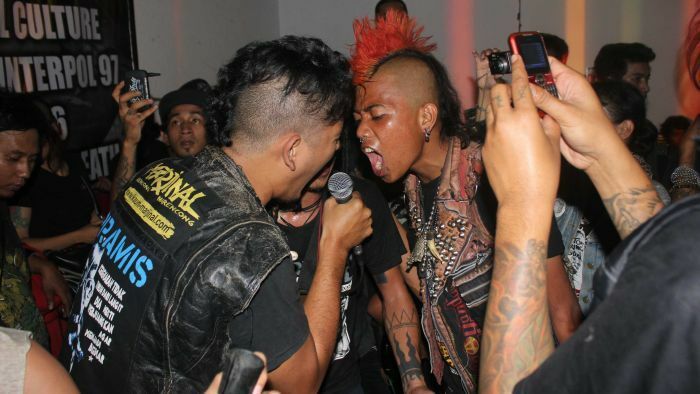 However, the Indonesian government have a different perspective on the punk movement, evident in the highly publicised incident in December 2011, where 65 youths were detained at a punk-rock concert due to “their threat to Islamic values” (The Guardian 2011 para. 13) in Aceh. The teens that were placed in a 10 day reeducation program had their hair shaven, were forced to dress in military clothing, pray and sing nationalist songs(VICE 2014). The local police chief Iskandar Hasan expressed that “they are not violating human rights” and was just “trying to put them back on right moral path” (The Guardian para. 13) after throwing the punks into a pool for “spiritual cleansing” (The Guardian 2011). One of the detained youths however rebut this by claiming that “We didn’t hurt anyone. This is how we’ve chosen to express ourselves. Why are they treating us like criminals?” (The Guardian 2011 para. 11). The punk movement challenges the repressive government beliefs and judicial system of adultery punishable by death, gays being thrown into jail and restriction in thought outside the Sharia (Noisey Vice, 2014). With the election of President Joko Widodo, the first real democratically elected president in Indonesia, and a self proclaimed “metal-head” (ABC 2013) perhaps true democracy and freedom of speech /thought can be realised. However, until then the punks will continue their crusade to fight corruption, repression and authoritarian rule.